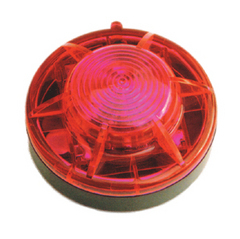 Robolight LED FlareLight™ Kit is the ultimate in LZ (landing zone) evacuations, traffic safety, control and warnings. FlareLights™ are small, extremely versatile and more effective and safer than traditional road flares. Providing a safe alternative with a wide range of applications, FlareLights™ can be placed anywhere, they have strong magnetic bottoms, and they use long-lasting, rugged LED technology. Place these anywhere! Setting up a Landing Zone Evacuation only takes seconds. For LZ landing applications simply attach the LED lights magnetically to the provided metal weights and place where needed. More effective and safer than standard road flares. Eliminate fire hazards associated with standard flares. Takes only seconds to setup and deploy. Lights can be seen for miles. LED Bulb Life: 10,000 hrs. Each #7029 Kits contains 4 Red and 1 Amber Flarelights and 5 separate metal support plates to secure lights to any surface. Batteries are also included. 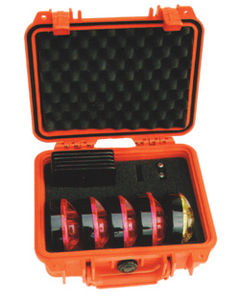 The LED Flarelight™ kit is housed in a small 1300 Pelican crushproof and waterproof case. Flarelights™ can also be purchased separately. We can provide you with a custom kit of the colors of your choice. Color choices: Red, Amber, White, Green & Blue. Call for custom FlareLight™ Kits! © 2019 Aircraft Dynamics Corporation. All rights reserved.